Sorry for the poor quality of the photo, but I have wrapped some of them so this is as good as it gets. I was rushing when I took them because the forecast was for rain this week which hasn’t hit just yet. The lavender smell in the house is heavenly. Mark has taken Sloan over to see the Grandparents in New Zealand. I am having such a lovely time with Rhys. How easy was it when we just had one child? I totally forgot and he is at such an easy, lovely age. I am hoping to finish a few more crafts and have been attending to those jobs in the house that I never seem to get to: cleaning out pantry, cleaning closets, cleaning house. Notice a theme…..lots ot clean around here! I am also indulging in my “Last Minute Patchwork Gifts” book and hopefully will have a few things to show next week. Enjoy your week. I am enjoying a bit of some breathing space and it feels so nice. 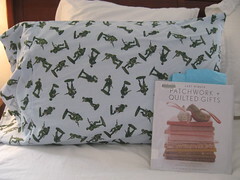 I found this very cute toy soldier fabric at Spotlight and wanted to make some pillowcases for my six year old nephew. I stumbled upon the “Last Minute Patchwork and Quilted Gifts” book at my local library by Joelle Hoverson. It has the most amazing projects. You can see the amount of post it notes I have on the pages in the photo. This is a craft book I would seriously contemplate buying because it is just filled with cute projects. The tablecloth and napkins in it are calling my name right now! 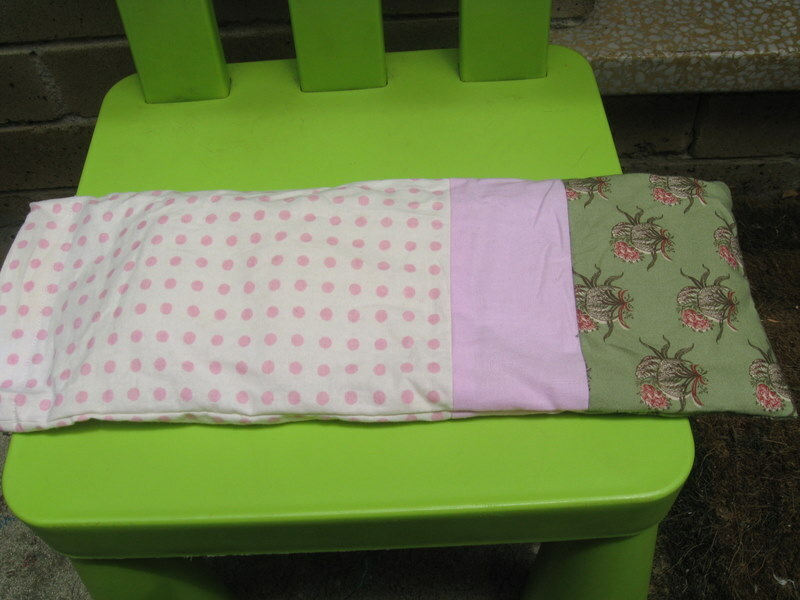 The pillowcase was really easy to make. I wish my topstitching was a bit better, but I think I would try a different tecnique next time. I always seem to learn the hard way on the first time project. 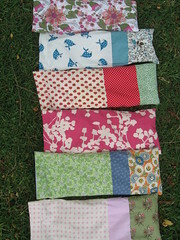 I am going to try to finish up some rice bags as last minute gifts for some overseas friends and family. I bought one and use it all the time especially during winter in our freezing house. 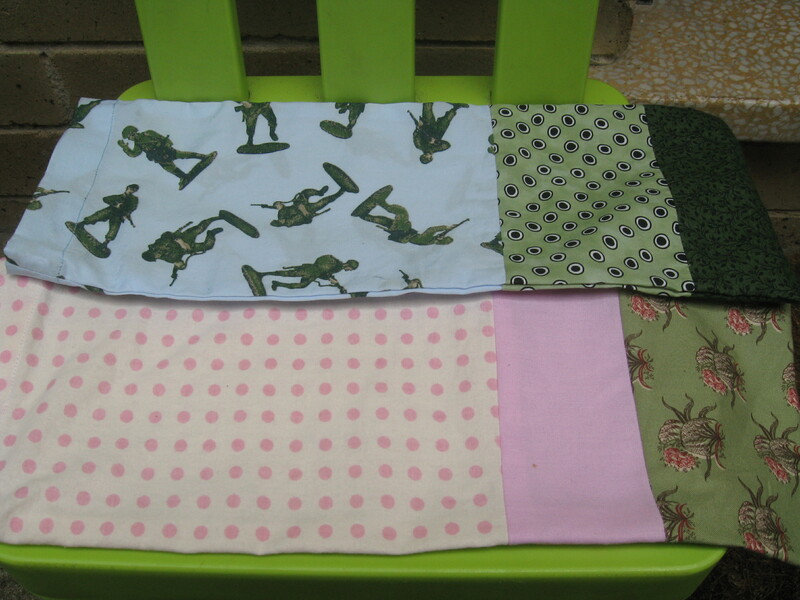 I found a great tutorial on the Sew Mama Sew blogand like the idea of the washable cover. I won’t stuff the rice in, just dried lavender and some instructions how to fill and sew off the inside rice bag otherwise the postage on rice bags overseas will kill me! Happy Christmas crafting everyone. I can’t believe how quickly it is coming! 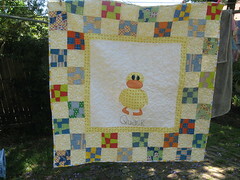 Latest baby quilt finished!!! The pattern and a lot of the fabrics were purchased at the Material Obsession stand at the Darling Harbour show this year. This was a very easy pattern that was fun to sew. I would recommend it to anyone who would like to make a quality baby quilt, but use an easy pattern that will not take weeks to make. It was also such a joyful design for either a boy or a girl. I am trying to keep up the sewing for some Xmas presents. So far I have a few things nailed down and a lot of ideas still swirling in my head. Hopefully I will have some more to show you soon! Did a push this weekend and finished the dolls. Now running to hide them before Sloan wakes up. She wants all of them for her and now….not Christmas. PS Pattern is from Wee Wonderfuls in case you were wondering. 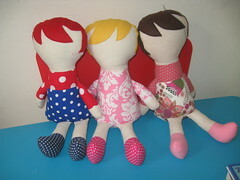 Three Christmas dolls waiting for faces and bows. Have a good weekend! Halloween was the best one ever. Other than Sloan refusing to wear her costume, the night was perfect. Here is one of my favorite photos from the night. 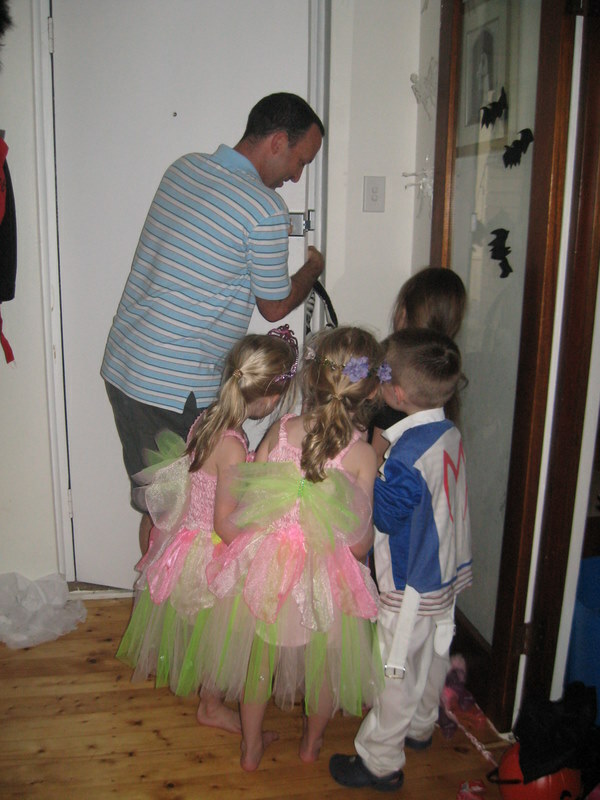 I think it captures the absolute joy, or maybe sugar high, the kids were on answering the door when the trick-o-treaters would ring our bell. I was pretty exhausted from a late night with the kids, but nothing could stop me from visiting the Gee Bend quilts in Canterbury. There were a lot of heavy fabrics and colours used in the quilts. I realize that part of the beauty of the quilts and their story is the quilters use what is on hand, but the fabrics didn’t appeal to me. I did love the simplicity of the designs and some of their use of colors. One lesson I did take away from the Gee Bend quilts was that a quilt doesn’t have to be “perfect” to still be beautiful or meaningful. 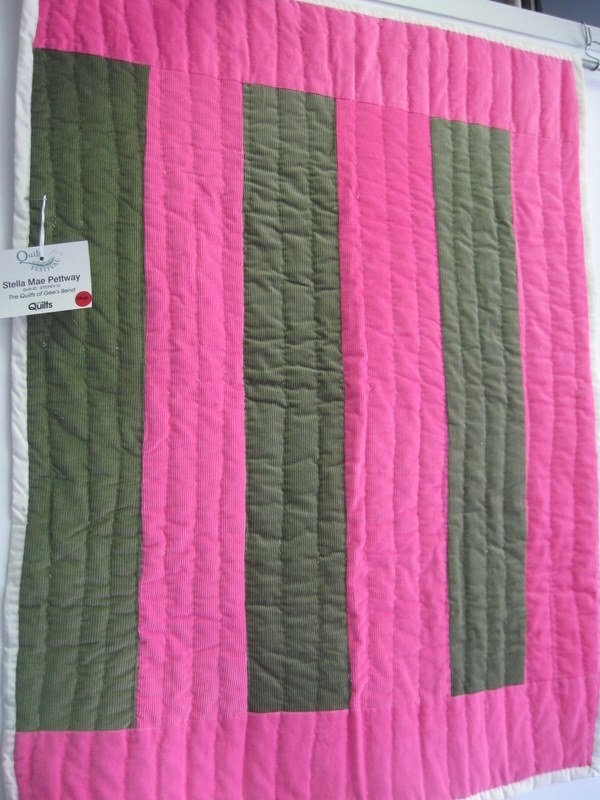 The Gee Bend quilts were really lopsided and not perfect squares, but it didn’t take away from the quilts. I think I get a bit too focused on trying to make my quilts follow traditional “rules” and trying to make them perfect squares or rectangles. There were also a lot of international quilts at the exhibit and the Japanese ones were just breathtaking. The attention to detail and use of fabrics just took your breath away. 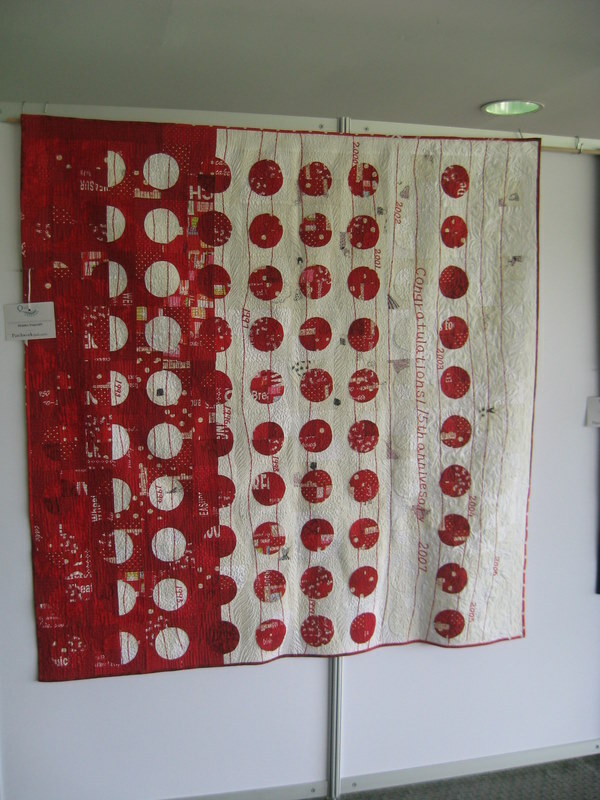 Here is a photo of just one of the beautiful Japanese quilts. I have posted lots of photos on Flickr. 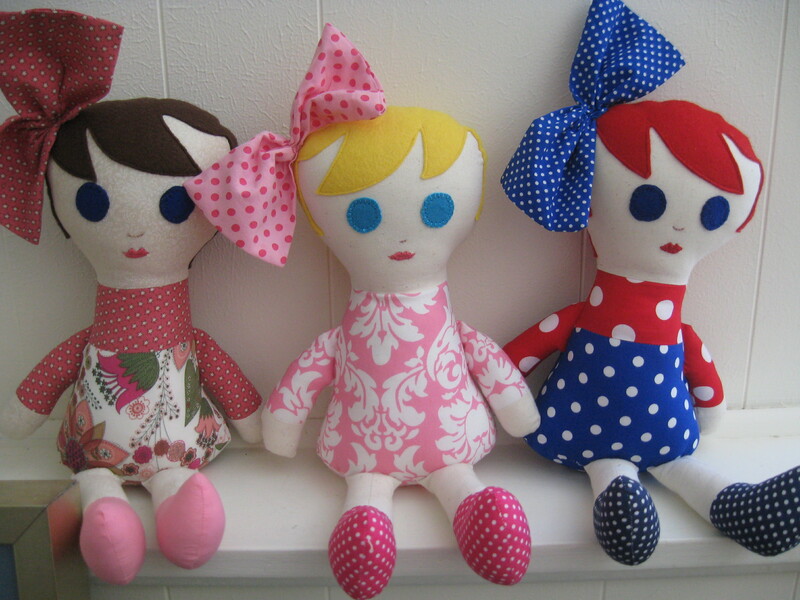 Okay, back to sewing on a quilt binding and I have dolls that need stuffing and faces. I did a quick visit to my sewing basket and there are a lot of projects started and not finished. I am going to try and focus grasshopper….and finish some of them!